A South Carolina administrative law judge ruled Friday that the anti-cruise coalition of neighborhood associations and preservation groups lacked standing to challenge a state permit that allows work to begin on the new Charleston cruise terminal, and he dismissed their suit which sought to prevent the start of construction. The Disney Cruise Line crew member who was arrested yesterday, appeared in court today, and was ordered held without bond, as a bit more of the story came out. CND subscribers also read about an arrest on Roatan ... going global ... and gelato anyone? 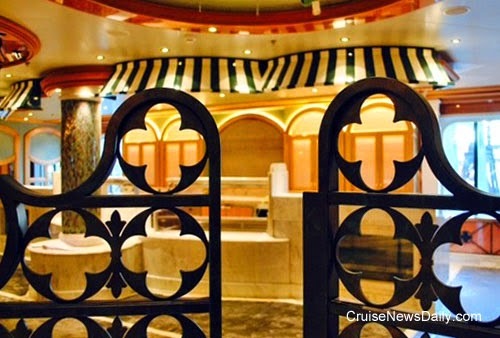 The gelato shop aboard Regal Princess shows the level of completion on the ship. Disney Cruise Line called Canaveral Port Authority Police to Disney Wonder soon after 8:00am this morning, to report that one of its crew members, a 36-year-old man from Indonesia, was accused of molesting a 13-year-old female passenger. Disney said they called the police as soon as they learned of the incident. The media is getting so excited about Norovirus on Crown Princess that they are missing the real story. They’ve been so panicked reporting about the “dozens” of passengers “stricken” with norovirus aboard the current sailing or Crown Princess (they don’t mention that there are more than 3,000 passengers who aren’t sick) that they are missing the real story about the outstanding job Princess has done in containing the outbreak, and only 104 passengers out of 3,141 were affected. Passengers aboard MSC Lirica last week got something extra to tell people about when they get home and people ask them what interesting things they did on their cruise. They will be able to say they know what it’s like to be aboard a ship that pirates are trying to board. * Is NCL Canceling a Couple Port Calls Enough? This week Norwegian Cruise Line canceled their calls (by Norwegian Dawn and Norwegian Jewel) at Roatan after a crew member ashore from Norwegian Pearl was shot and killed on Sunday during an armed robbery in broad daylight on the street when the thief apparently only wanted the man’s cell phone. Information has been limited because the police in Honduras operate in secret when investigating criminal matters. Police arrested two suspects on Monday, and the country’s security minister announced it with great fanfare, but police released them late Monday when they said it was determined the two weren’t involved in the crime. NCL’s statement says only that their calls were canceled this week in “an abundance of caution,” but the line declines to say any more. It appears by their statement that their calls are only canceled this week, and passengers can expect to call at Roatan next week despite the rising rate of violent crimes. Since NCL will not clarify their position, they have to be taken at their word and assume only this week’s calls are canceled. But is this enough for Norwegian and other cruise lines to do at this port and other ports when there is a rising crime rate? In this CND article, we discuss what we believe they should be doing. CND subscribers also read about RCCL closing the sale on the Pullmantur companies ... when it's not a cruise line, but it's paying the bills ... and Costa joining the club. It was just a few days ago we told you that Royal Caribbean had decided to send Explorer of the Seas to the UK for the summer of 2015, homeporting it at Southampton. Today, they said where Explorer will go at the end of the season. During the 2015-2016 season, Explorer will be used to expand capacity in Australia for their peak summer season. CND subscribers also read about bad news for AIDA from Mitsubishi ... Norwegian joins the FIFA club ... and the milestones keep coming. 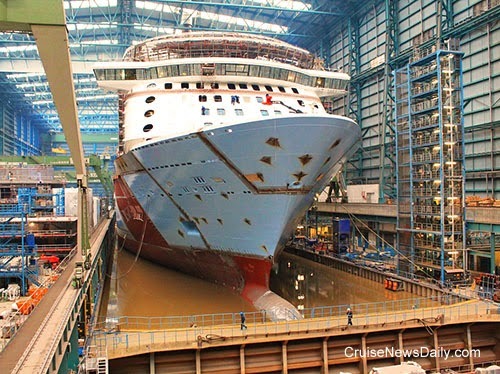 Quantum of the Seas was floated up for the first time at Meyer Werft on Monday. In most markets, Carnival sails the same schedule year round week after week, or the same pattern consistently. In order to offer some variety to regular customers, they will occasionally schedule some longer cruises that can take the ship to other ports than they could normally reach in their allotted time. Regal Princess is still scheduled to sail her inaugural cruise from Venice on May 20, and work inside the ship is moving closer and closer to completion every day. CND subscribers also read about a new position and the search is on ... more recognition of the economic benefit of cruise ships ... an infant medevaced from Coco Cay ... and another milestone for Quantum. 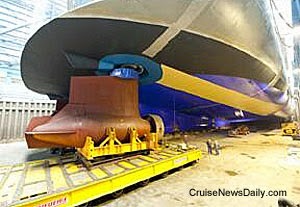 Quantum of the Seas last Friday at Meyer Werft. MIAMI – April 7, 2014 – Adam Goldstein has been named president and chief operating officer of Royal Caribbean Cruises Ltd. (NYSE, OSLO: RCL), the company announced today. Goldstein, a 25-year company veteran, had spent the previous 12 years as president and CEO of the company's largest cruise line, Royal Caribbean International. As well as working with Fain on the company's strategic direction, Goldstein's portfolio will include Human Resources, Information Technology, Supply Chain, Corporate Communications, Safety & Environment, Government Relations, Guest Port Operations and Commercial Development. “We believe that it's important for our brands to have their own personalities and business plans,” Fain said. “But it's also important to pursue best practices, and to make sure that the insights we learn within individual lines can be applied to the entire company's benefit. When we do that, we are a stronger business,” Fain said Goldstein said he was looking forward to the challenge. Goldstein begins his new responsibilities immediately, Fain said. A search for a new leader for the Royal Caribbean International line is underway. In the meantime, Goldstein will assist with transition while he also takes up his new responsibilities. Goldstein joined the company in 1988, and served in a number of positions before taking the helm of Royal Caribbean International, including Senior Vice President, Total Guest Satisfaction; Senior Vice President, Marketing; and Corporate Secretary to the company’s Board of Directors. Goldstein is a member of the Washington-based Energy Security Leadership Council. He served on the board of the Travel Industry Association of America (now the U.S. Travel Association) from 1993 to 2012, and is a member of the advisory board for Our Kids, which is engaged in foster care and related services for Florida youth. Goldstein graduated with honors from Princeton University. He also has a law degree from Harvard University and an MBA with distinction from the French business school INSEAD. Goldstein and his wife have two children and live in Coral Gables, FL.